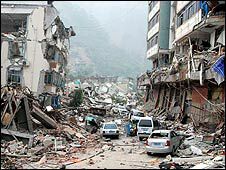 On Monday, May 12, 2008, at 2:28PM, local time, a massive earthquake of 7.9 magnitude (upgraded to 8.0 by Chinese authorities) occurred in China. The epicenter was located at 31.084°N, 103.267°E, in Wenchuan County, of the Aba Qiang autonomous prefecture of Sichuan province. This is about 50 miles west northwest of Chengdu, the capital city of the Sichuan province. The earthquake has been named the Wenchuan earthquake. The earthquake occurred on the Longmenshan fault where the India tectonic plate pushes northward against the Eurasia tectonic plate. As a result of these forces, the Sichuan plain smashes into the mountains leading to the Tibetan highlands. The convergence of the two plates results in the uplifting of the Asian highlands and by the eastward motion of crustal material away from the uplifted Tibetan Plateau. This uplifting has caused these mountains, known as Dragon's Gate Mountains, to be among the steepest and most rugged of the mountains in the world, steeper than the Himalayas. During the main quake, the earth rumbled for about three minutes. Within the next 24 hours, there were over 2000 aftershocks. Some of the aftershock quakes registered over a 5 magnitude on the Richter scale. 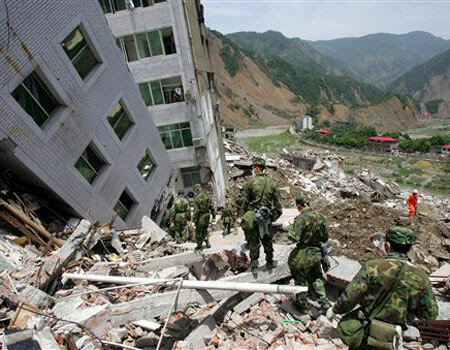 The towns and villages in Wenchuan county, Mao county, and nearby Beichuan county of the Mianyang prefecture were the hardest hit. The region is a treacherous rural mountainous region. Its small villages and towns are situated mostly in the valleys, some on the hillsides. 80% of the buildings in Beichuan county were destroyed. School buildings in Beichuan city and Dujiangyan city collapsed burying hundreds of school children. Over 50,000 people were buried under the rubble of their homes or offices. Over 200,000 people have been evacuated from the area. Reservoirs were weakened and damaged. The Zipingpu Hydropower Plant located 20 km east of the epicenter was destroyed. A landslide destroyed the road to Dujiangyan city. Roads leading into Wenchuan, Mao, and Beichuan counties buckled like freeway off-ramps leading to nowhere. Tops of mountains were sheared off. Their rocks and boulders roared down the mountain blocking roads and burying the villages below. 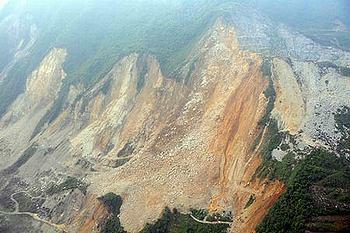 Landslides triggered by the aftershocks raked gigantic gashes in the mountainsides. Villages like Donghekou were swallowed whole, completely covered by the landslide. Their inhabitants were entombed within. The roads to Dujiangyan city were completely destroyed by the landslides completely cutting off their inhabitants. from rescue teams. Main streets of villages were devastated. Buildings looked as if they had been bombed out. In the town of Juyuan, south of the epicenter, a three-story high school collapsed, burying as many as 900 students. In Beichuan county another 1,000 students and teachers were buried when a high school collapsed. The school building was reduced to a pile of rubble two yards high. An estimated 10,000 school children died because of shoddy school buildings that caved in on them. Parents of the dead students built makeshift religious altars at the site, resting their dead children on any available piece of plywood or cardboard. Roads to the villages ended in a tangled twist of metal and crumbled concrete. Sichuan's civil affairs office had to provide shelter to 4.8 million displaced people at nearly 3,000 locations. About 14 minutes after the earthquake, the People's Liberation Army of China was given orders to began to mobilize 113,000 soldiers, 115 medical teams, and 78,000 tons of supplies. Within the hour they began to reach the disaster area by airplane, helicopter, or by vehicle. Within 90 minutes after the earthquake, Wen Jiabao, China's Premier, was on a plane to Chengdu, the capital city of Sichuan province. Within a few hours after landing, he was on the scene at the devastated city of Dujiangyan. He has been in almost constant tears as he helped direct the relief effort. He told government officials: "the people feed you, you know what you must do." With roads cutoff and/or destroyed in the rugged mountainous terrain, the People's Liberation Army could not reach much of the disaster area with its heavy equipment. They had to proceed by foot. Populated areas near the epicenter of the earthquake were inaccessible. They could not even be reached by foot. The 15th Airborne Corps, the elite airborne paratrooper unit, sent 100 paratroopers into the heart of the devastation of Mao county, carrying relief supplies. Mao county, located northeast of Wenchuan county, was completely inaccessible by any other means. The devastated terrain was so rugged that relief helicopters were not able to find a clear landing place. A clear landing place was eventually located from satellite photographs taken after the disaster. Over 90 relief helicopters were finally employed. Using wall-piercing radar and heavy engineering equipment, the rescue workers pulled over 21,000 survivors from the rubble of thousands of buildings. Many dead were extracted from the rubble. For them and their loved ones, the human grief and tragedy cannot be measured. Each of thousands of families lost their only child. Children lost their parents. Many families lost everything. There were over 360,000 people injured. Over 69,000 people who died and more than 19,000 still missing. 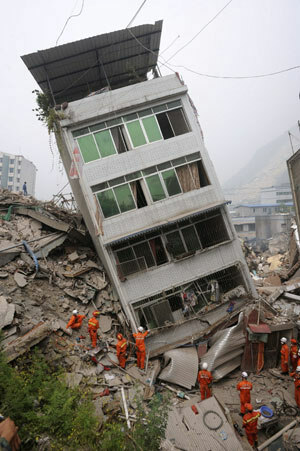 More than 5 million houses in Sichuan, and neighboring Gansu and Shanxi provinces were destroyed. Nearly every building in Yingxiu was destroyed. About half of the town's 18,000 residents are either dead or missing. The story is similar in Beichuan city. Those who were lucky and survived were evacuated with whatever few belongings they could retrieve and hand-carry, if any. All of China is crying and mourning. are sufficiently long to sustain a strong ground-shaking earthquake, making them potentially serious sources of regional seismic hazard. 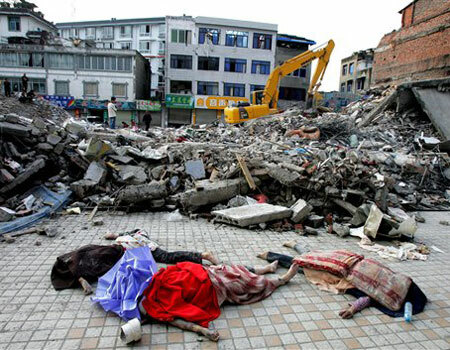 The Wenchuan earthquake was in fact the most deadly earthquake in China since the 1976 earthquake that occurred in the city of Tangshan near Beijing. That earthquake killed 240,000 -- although some reports say as many as 655,000 perished -- the most devastating in modern history. In 1933 an earthquake struck near the epicenter of the Wenchuan earthquake. It killed at least 9,000.